Spanish Birthday Card - Harnel, Inc.
To be cherished for life, special occasions demand attention and importance to become indelible. If a special occasion in the life of your loved one is about to arrive, grab the opportunity and make it even more special with Spanish greeting cards that we, at Harnel Inc., have to in the store just for you. Warm wishes, and that too in Spanish, one of the most beautiful languages, would touch the heart of your dear one and express your feelings in a way like never before. Since its inception, Harnel Inc. has been the ultimate online spot of many individuals to choose the best Spanish greeting cards online. Backed by an extensive collection of beautiful and distinctive Spanish greeting cards, Harnel Inc., is a name that leaves no stone unturned in offering its customers with ways to communicate their feelings to their near and dear ones. At Harnel Inc., we believe that every occasion is important and deserves to be celebrated. Our vast greeting card range is a proof that we respect the feelings & emotions of our prestigious customers and help them showcase their emotions through exquisite & vibrant cards. Be it Baby Congratulations, Get Well Cards, Sympathy Cards, or Miscellaneous Cards, our variegated selection of Spanish greeting cards is quite exclusive and exceptionally delivers the message of love. 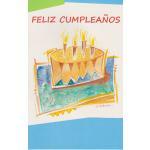 With Harnel Inc., at bay, there’s no need for you to look elsewhere for Spanish birthday cards! Whether you need Feliz Cumpleaños cards or Feliz Quince Años cards, all you need to do is explore our broad Spanish birthday card collection to choose the most beautiful one. Readily available in a string of beautiful designs and prints, our extensive Spanish greeting cards collection is one-of-a-kind. Going through the huge collection at Harnel Inc. will introduce you to a series of Spanish greeting cards that comprise heartfelt wishes that need no further explanation. Give us, at Harnel Inc., a chance to be a part of your special occasion and make it even more noteworthy with the help of our vast Spanish greeting cards assemblage. Get started with your search for the perfect card now!